Eggplant is a fickle fruit. It is technically a fruit and not a vegetable, despite its savory leanings. Its flavor can be unpleasantly bitter. 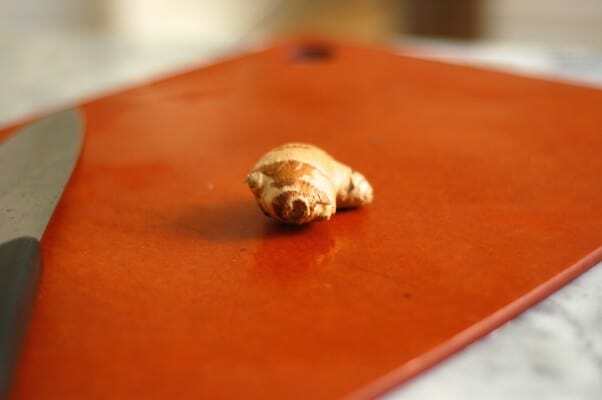 Its texture can be too chewy or too mushy if it is over or under cooked. It can act like a sponge when it’s in a pan with oil, becoming heavy and sodden. And yet its popularity persists. Probably because when eggplant is done well, like in eggplant caponata or in this Sichuan dish, it can be tremendously good. 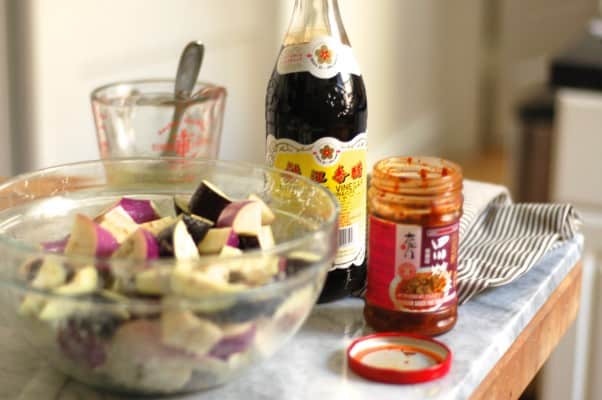 Despite its name, fish fragrant eggplant contains no fish or fish sauce. 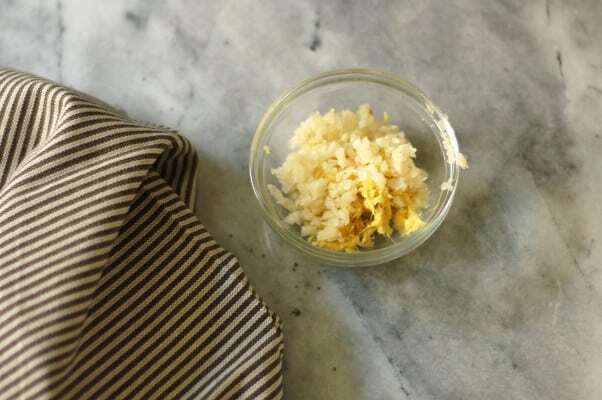 Instead, it uses the same pungent mix of hot, sour, salty, and sweet flavors that are traditionally used for cooking fish and seafood in Sichuan cuisine. This dish is traditionally deep fried, and I have little doubt that it is delicious when prepared that way. But I don’t deep fry anything on a weeknight, and this dish is too good to save for the rare occasions I’m willing to deal with disposing of a vat of hot oil. Instead, I soak the eggplant in water for about 20 minutes and then rub it with cornstarch before sautéing it in a small amount of oil in a hot wok until it’s browned on the outsides and tender in the middle (a technique I learned from Maggie at Omnivore’s Cookbook). This recipe is adapted from Fuchsia Donlop’s Every Grain of Rice, a great book for anyone looking to get started with approachable Chinese home cooking. I’ve made vegetarian versions of this dish, sans bacon and with water subbed in for the chicken broth, and it’s pretty great that way. But it turns out I like it even better when it’s got some smoky bacon added. Bacon, as far as I can tell, is not a traditional Sichuanese ingredient, but pork certainly is, and I’ve seen many versions of this dish that use ground pork for meaty oomph. 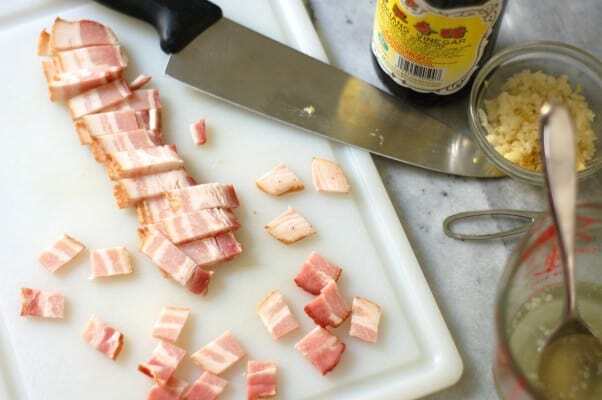 One day I had some extra strips of smoky, thick-cut Nueske’s bacon in the refrigerator that I didn’t want to go to waste and decided to cut it into little pieces and toss it in the wok and then cook the eggplant in the bacon fat. After that, I haven’t made it any other way. This is some of the best Chinese food that I’ve ever produced at home. It’s become one of my favorite things to make during eggplant season. 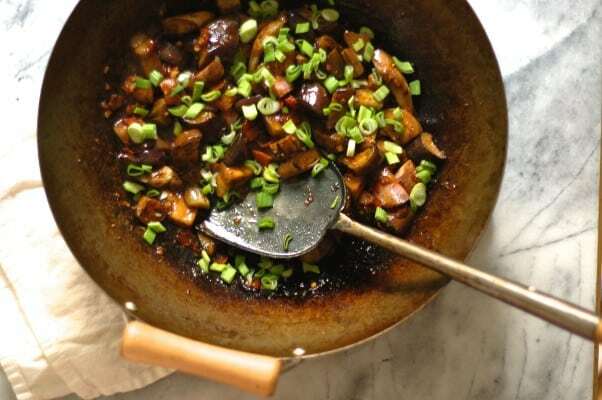 Somehow, the combination of Sichuan chili bean paste, Chinkiang (black rice) vinegar, ginger, garlic, and scallions (oh, yeah, and bacon) turn the humble, fickle eggplant into something deeply savory and addictive. Looking for something else to do with that Chinkiang vinegar and Sichuan bean paste? Try this Sichuan send-the-rice-down chopped celery with beef. It’s so good. Despite its name, this dish contains no fish or seafood products (hence the scare quotes). 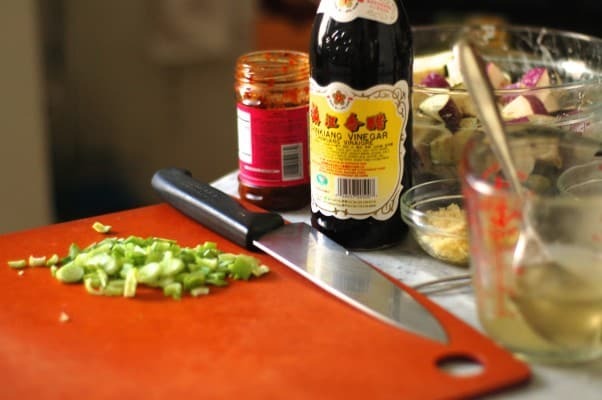 The name refers to the preparation, which is typically used for fish in Sichuan cooking. 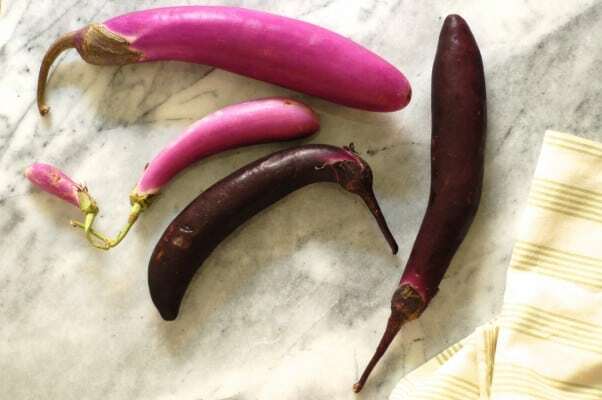 I prefer to use long skinny Chinese or Japanese eggplants here, but it will work with Italian varieties if that’s what you have. Dunlop recommends deep frying the eggplant, but in my version I lightly sauté it, which I find easier. The Sichuan chili bean paste can be tricky to track down. The most widely available brand of chili bean paste, Lee Kum Kee, is Cantonese rather than Sichuanese and not quite right for this. If you can’t find any of the Sichuan stuff locally, it’s available online. 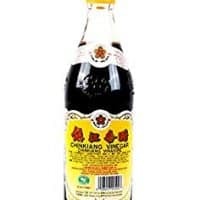 The other ingredient that’s probably less familiar to western cooks is Chinkiang vinegar, which is also called black vinegar or black rice vinegar. I found mine at Golden Pacific, a Thai grocery store in Chicago [edit: Chicago friends, it's closed, sigh, but you can find this at Tai Nam on Argyle], but of course it’s also available online. If you want to make this vegetarian, you can omit the bacon and substitute water for the chicken stock. I like to serve this with jasmine rice. 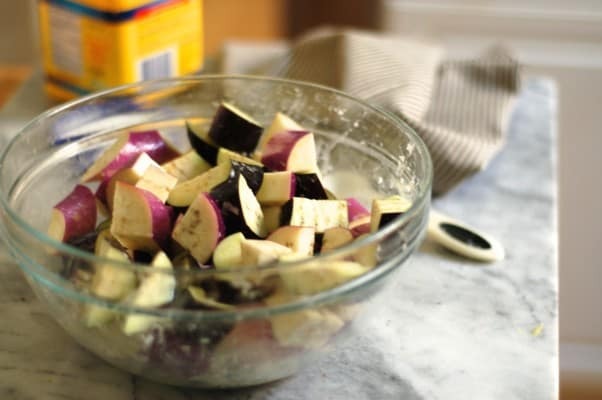 Place the chopped eggplant in a saucepan or bowl and cover with water. 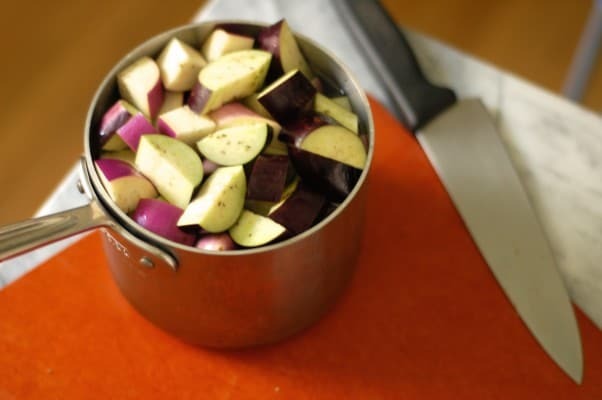 Place a tight fitting lid or plate over the saucepan or bowl to keep the eggplant submerged (the eggplant tend to float up to the top, so do this over the sink to avoid spills). Let sit for 20 minutes. 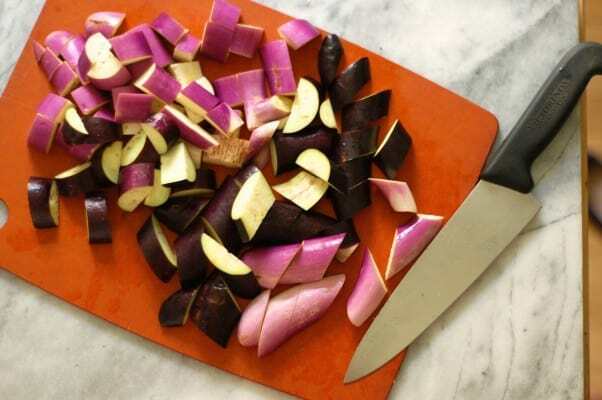 Drain the eggplant in a strainer and toss with 2 teaspoons of cornstarch, rub in to coat. In a small bowl mix the remaining teaspoon of cornstarch with one tablespoon of cold water to make a slurry and set aside. Heat a wok or large skillet over high heat. Add the bacon in a single layer and cook until crisp at the edges, this should only take a few minutes. 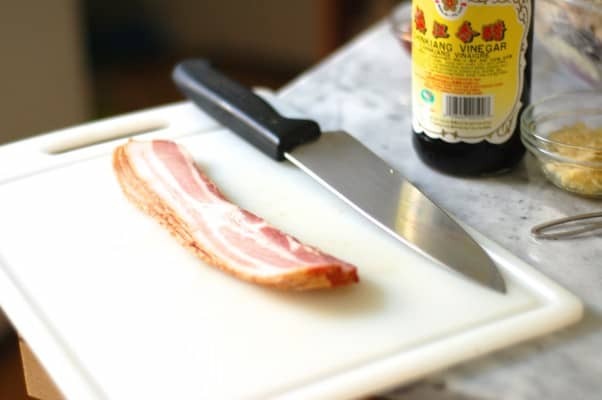 Remove the bacon from the wok with a slotted spoon or spider and set aside on a paper towel-lined plate, leaving the fat in the wok (if you’re skipping the bacon, add some oil to the pan). Return the wok to the stove over high heat and add the eggplant. 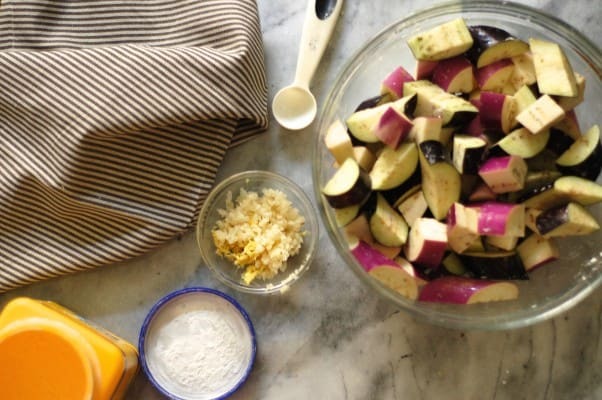 Sauté until the eggplant is browned on all sides and softened in the middle. 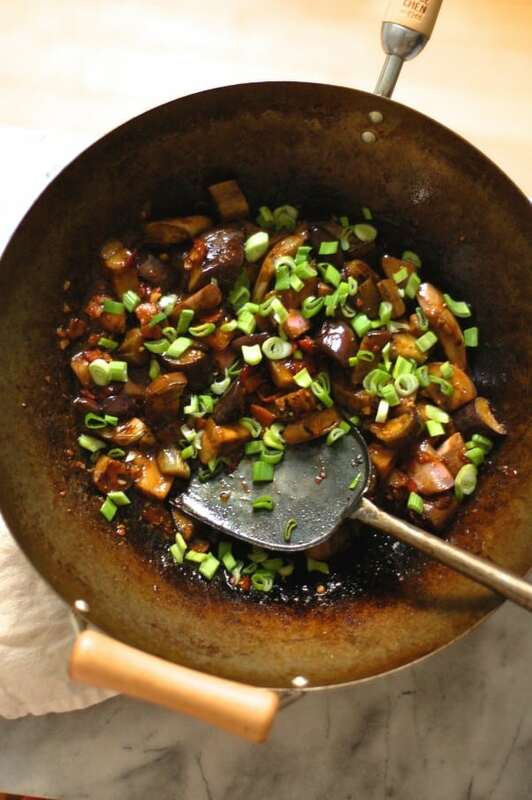 Remove the eggplant from the wok and set aside on a plate. 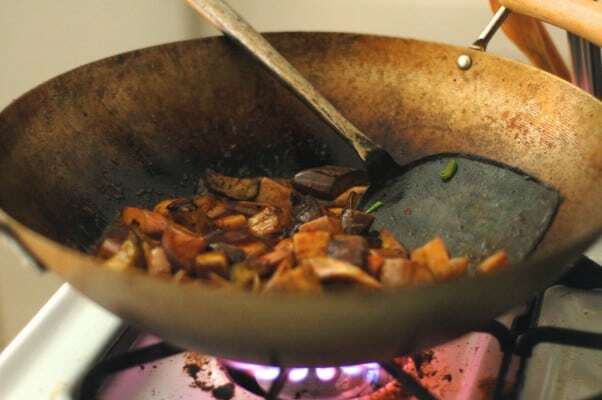 Return the wok to the stove over high heat. Add a few tablespoons of oil and the chili bean paste and stir-fry until the paste is fragrant, about 30 seconds to 1 minute. Add the ginger and garlic and stir-fry until they are fragrant, another 30 seconds to a minute or so. Add the chicken stock (or water) and sugar and give everything a stir. Add the eggplant and bacon and bring the sauce to a simmer. Stir in the cornstarch slurry and simmer for another minute or two to thicken the sauce. Stir in the Chinkiang vinegar and scallions. Serve. Made this last night and it was delicious! I added green pepper to the bacon, mushrooms to the eggplant and skipped the first corn starch rub. I will make this again and again – thanks so much for the recipe and glad I found your blog! I’m so glad you liked it! This is one of my favorites (and, as you’ve clearly discovered, it’s a flexible dish with many variations that work). I made the Sichuan Send-the-Rice-Down Chopped Celery with Beef tonight, which was easy and delicious. Can’t wait to try this one next. I found the chili bean paste at Broadway Supermarket here in Chicago (after trying a few other places…). Might have to get this cookbook! I’m sorry to say that the chili bean paste is essential to the flavor of this dish. Any substitution would really change the flavor profile. You can buy chile bean paste on Amazon (there’s a link to some in the recipe description) if you have trouble finding it locally. Hi Mary, I just made this tonight after finally gathering all the necessary ingredients and I have to say thank you for my current food coma 🙂 it was delicious, just as you promised!